Hi Folks! It’s been a busy, busy time and things have kept me away from my blog posts, but I’ve re-surfaced and so you can expect more posts from me from now on. 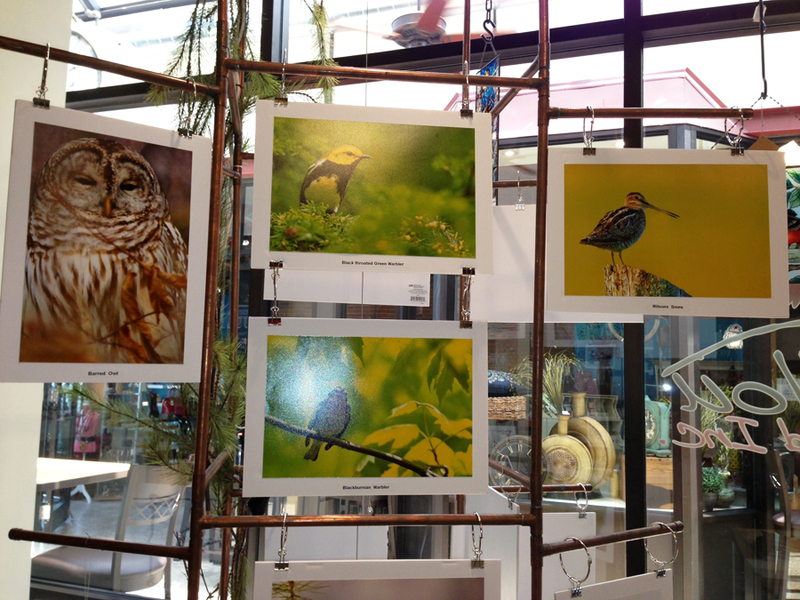 Just wanted to let those of you in the Ottawa, Ontario area know, that the exhibit of my bird images at the Gilligallou Bird Shop in Almonte, Ontario will be ending this weekend. So while the weather is cool, the humidity is down, and you want to get out for a nice drive in the country, do it now. The exhibit will be coming down at the end of July. Me, in front of my display of bird photos. They’ll be on display for the month of July, so drop on by to have a look. A big thank you to Bob and Louise at Gilligallou for their kindness in letting me show some of my images in their store. Be sure to check out their store. It’s packed full of great things – anything to do with birds. 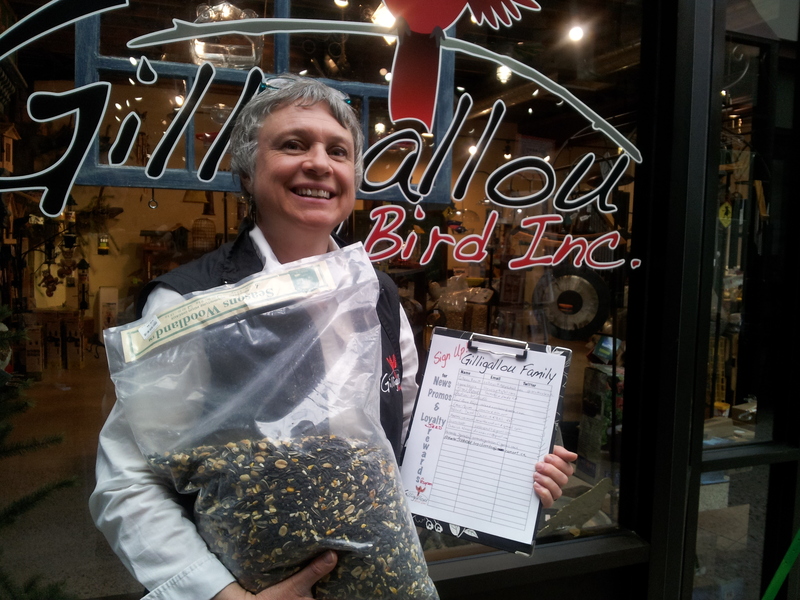 They sell very high quality bird seed for birds of all kinds. With early mornings filled with the melodic sound of bird song, it’s a great time of year to enjoy hearing and seeing our local birds. Thanks to Bob and Louise at Gilligallou Bird Inc shop in Almonte, Ontario, yesterday I was able to help people see what some of our local birds look like close up. 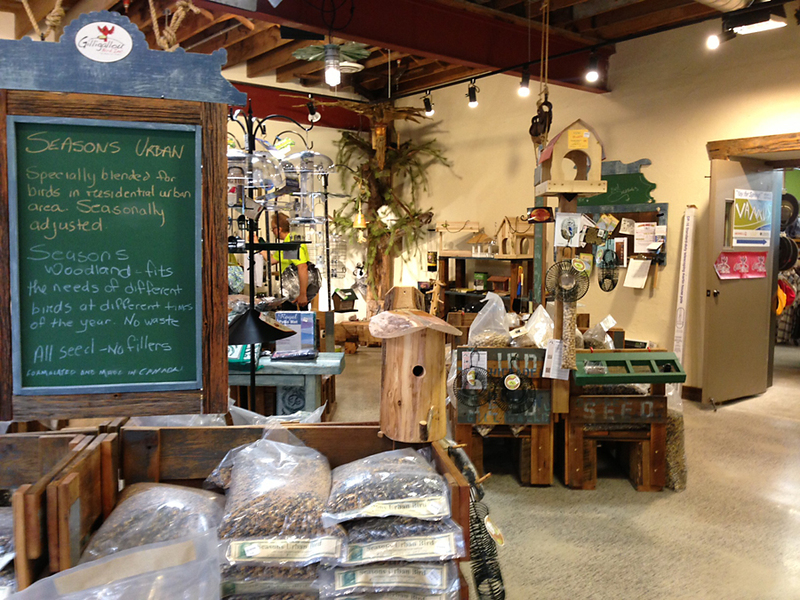 Bob and Louise have a fabulous shop that is all about birds – feeders, houses, seed, books, binos, and a ton more! It’s one of my favourite shops in Almonte and my visits there usually take a while as I look at all the fantastic things they have in their store. 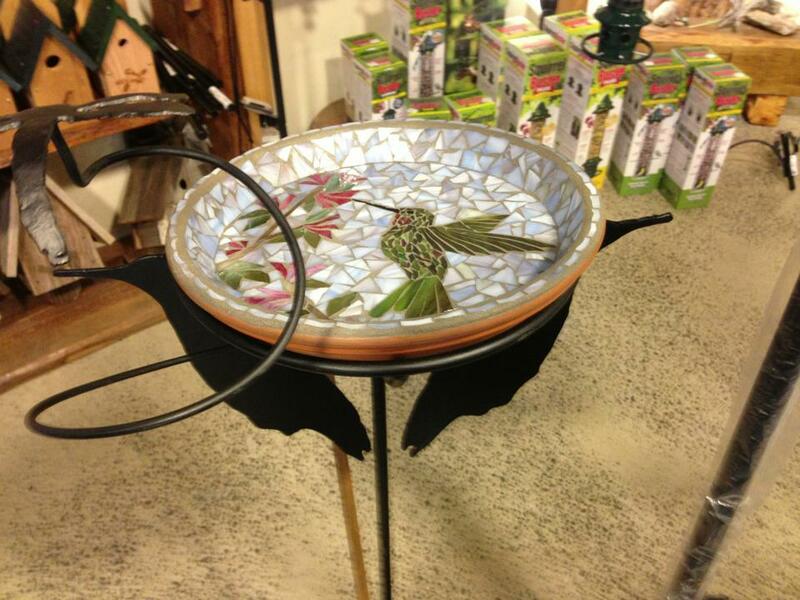 I have my eye on a gorgeous glass bird bath they sell, so I know I’ll be back soon. I have 14 photos on display in the store. 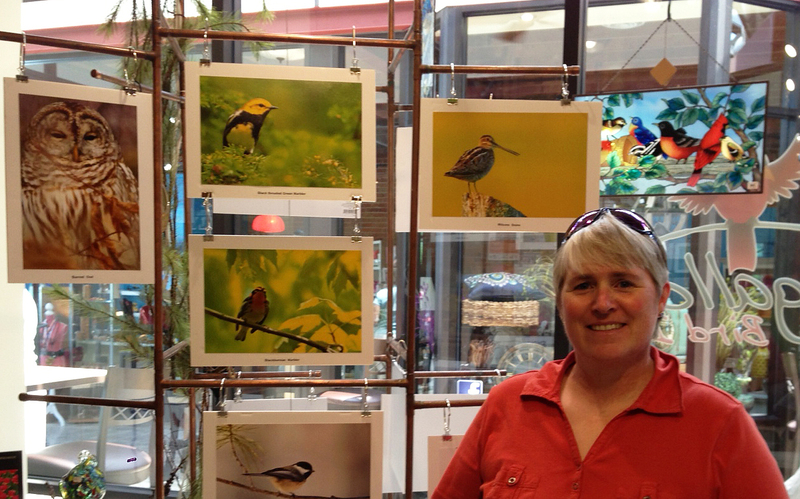 All the birds in my exhibit are species that occur in the Ottawa area. If you’re in the Ottawa area, I hope you’ll pop down to Gilligallou to check out my images. While you’re there, you will have to take some time to look around the shop at all the amazing bird feeders, houses and other incredible things. I guarantee you that you can’t just pop in for a quick look. There are too many neat things to see. If you’re needing a new bird feeder or have run out of seed, this is the place to shop. And if you have questions about your feathered friends – what to feed them, what kind of feeder you need for them – Bob and Louise are incredibly knowledgeable and will be able to help you. Thanks Bob and Louise, for such a great opportunity! This weekend I finally got out for some bird photography – way behind schedule, but life’s been a bit crazy lately and well, as they say, better late than never. I ended up photographing one of my favourite birds – a Black-throated Green Warbler. This little guy has set up shop on the same territory for 2 years. It’s nice to have him back. Read about and view 44th Parallel Photography’s Photo of the Week by clicking on the thumbnail below. As we count down to Christmas, some of us who haven’t yet started our Christmas shopping may have a slight feeling of panic building. Time is ticking….. If you’re shopping for friends and family who are photographers, don’t panic. I’ve already posted a list of 12 great photography gift ideas. And the great part is that most of these things can be purchased online. So if you can’t get out and about to buy them, don’t worry. However, I will say that if you can buy locally, why not support your local camera store? One item I had on my list that I’d like to write a bit more about are a pair of e-books, about bird photography, by Alan Murphy. If you’re into bird photography, you’ll know Alan Murphy’s name. He’s one of the top bird photographers out there. I love his images – clean, simple, tack-sharp and well…. stunning! Check out Alan’s website. Producing incredible images is certainly the first thing that attracts me to a photographer. But the second thing that seals the deal for me – makes me a loyal follower – is that person’s attitude toward the rest of the photography world. By this, I mean, their willingness to share. Those who are willing to share their techniques and not keep them closely-held secrets are tops in my books. And Alan is one of those. In fact, I emailed Alan recently to ask him a question about one of his books and got a really pleasant and informative response. Alan has written two e-books on how to attract birds for the purpose of photography. His first e-book, The Guide to Songbird Set-up Photography, is a 106 page pdf e-book packed full of fantastic information and advice about setting up perches using natural materials (flowers, tree and shrub branches, rocks, etc.). For example, Alan includes a section on setting up flowers for hummingbird photography. He includes a tip on how to ‘bait’ the flowers with a bit of sugar-water to get the birds to the flower. Can’t wait to try this approach next spring! He also includes chapters on how to attract certain species of birds as well as how to attract and photograph certain taxa of birds, such as waterfowl and shorebirds. Alan’s second book, The Photographer’s Guide to Attracting Birds, released recently,offers up even more detailed and specific information . For example, Alan has a chapter on blinds and camouflage, which is extremely informative. His book also includes chapters on attracting birds using insects, decoys, and audio playbacks. He also has chapters on attracting specific birds such as flycatchers, songbirds, and shorebirds. This book is as jam-packed with excellent information as the first one. Copies of the book can be purchased directly from Alan’s website. I highly recommend these books as a wonderful gift for the nature or bird photographer on your Christmas list. You can’t go wrong with these books. And by buying e-books, you’ll see sparing a few more trees. Good luck with your Christmas shopping. But most of all, don’t forget to enjoy the magic of the season. 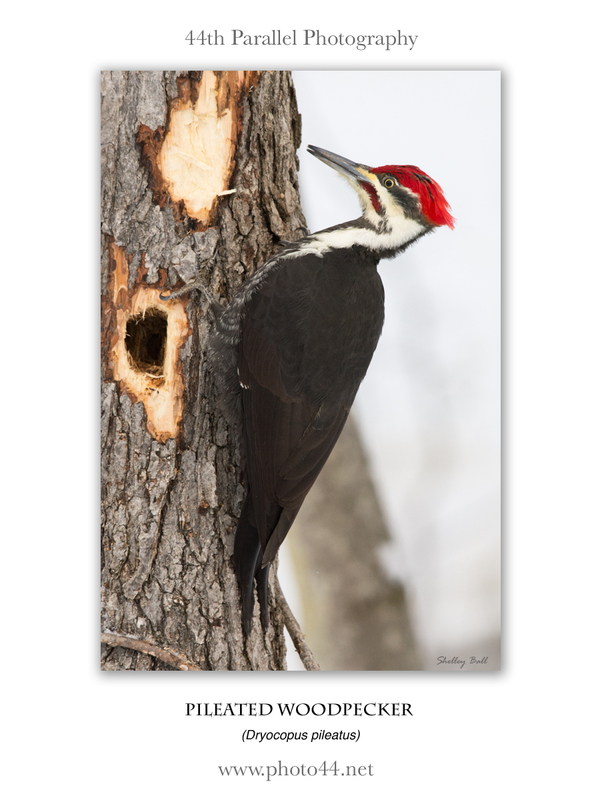 44th Parallel Photography’s Photo of the Week is back. I missed last week. Not a good week, with having my $1200 tripod, Wimberely gimbal tripod head and flash bracket stolen. This week’s photo is of a young Osprey taking its first little taste of flying. While we watched, it didn’t manage to leave the nest, but it came close a few times. There were several of us watching and cheering it on. I think we all knew what it was like to try to find the courage to make that first big leap in life. We try not to be anthropomorphic, but at times like this, you just can’t help it. Click on the image below to see this week’s Photo of the Week.